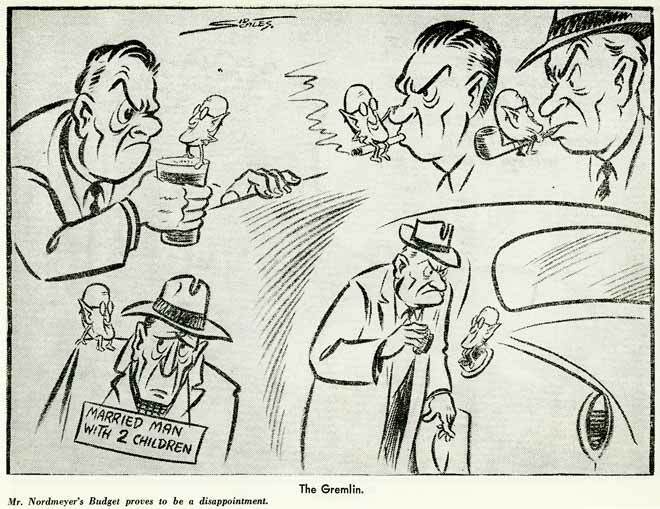 Minister of Finance Arnold Nordmeyer is pictured here as a gremlin irking the beer drinker, smoker, married man with children and the motorist. His 1958 budget doubled taxes on beer and cigarettes, and there were increases in sales taxes on cars and petrol. It cancelled a much-vaunted £100 ($4,242 in 2008) tax rebate for that year. Labour was thrown out at the 1960 election.